Developed by Atari in 1980. The very first official commercial port of one company's game to another company's console. As the first conversion, the emphasis was not on capturing the original look of the arcade, but simply the game play. To that end, Atari did a good job, and the game proceeded to sell the system to homes that didn't yet possess one just so people could play Space Invaders at home. Multiple variations of game plays exist, including different ways for two players to play cooperatively or competitively. A cheat enables one player to fire two bullets at once, instead of just one, by holding the reset button down while powering the system on. Developed by Atari in 1982. In an unusual move for Atari, the 5200 version of the game is different from the 8-bit home computer version of the game. In many ways, it's an improvement. Though the graphics do not come any closer to the arcade, the gameplay does. Shields are present, and even though the invaders march on to the screen from the left, there is no "mother" invader present on the screen. Developed by Atari in 1980. 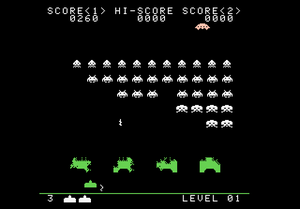 Generally speaking, the Atari 8-bit line of home computers were considered homes to many accurate arcade conversions, but this version of Space Invaders diverges the most from the arcade version compared to any other Atari conversion. No shields are present, and there is a kind of mothership present on the side of the screen that the aliens appear from. Original Game Boy version developed by Taito in 1990. Reprogrammed for the Super Game Boy by Taito and published in the U.S. by Nintendo in 1994. When accessed through the Super Game Boy, two modes are available. There is the Super Game Boy enhanced mode of the original Game Boy version, but the game also contains a full Super Nintendo program that is identical to the SNES entry below. Developed by Taito in 1985. A near pixel accurate conversion of the true-color version of the arcade game. Developed by Taito in 1985. Not quite as pixel accurate as the MSX conversion. All invader sprites were forced to fit inside of the Famicom's 8x8 pixel tile size. Published by NEC Interchannel in 1995. By all accounts, it is similar to the SNES version, including the two player competition mode. Developed by Sega in 1985. 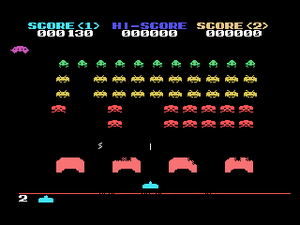 A near pixel accurate conversion of the true-color version of the arcade game, although with a slightly different color palette for the aliens. Developed by Taito in 1994. Republished in the US by Nintendo in 1997. 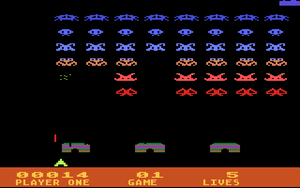 This was the first conversion of Space Invaders to provide players with the option to simulate one of four different varieties of the arcade machine. Players could choose between a black & white mode, color back drop mode, color celophane overlay mode, and true color mode. Additionally, there was a two-player only competition mode. This conversion served as the model for most future releases. Developed by Taito and published by Sunsoft in 1999. Pretty much a straight pixel accurate reverse black and white conversion like the original Game Boy conversion. 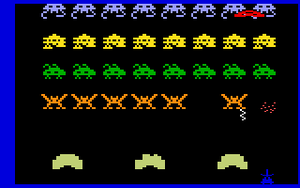 Developed by David Sullivan, the most accurate conversion of Space Invaders for the Apple II. As one of the oldest games on the oldest home systems, Space Invaders has inspired a lot of work on the Atari 2600. The original ROM was first hacked by Rob Kudla to more accurately reflect the look of the arcade, including the sprites and the colors. 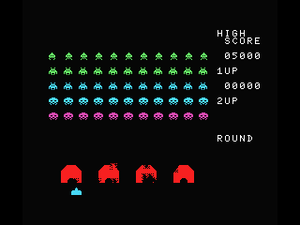 That was further hacked by Nukey Shay into Space Invaders Deluxe which adds the Taito RGB colorization of Space Invaders as well as all as many of the additions found in the Deluxe version of the arcade game. Two homebrew games were built from the ground up. Space Insitgators attempts to get as close to the look of the arcade, sacrificing as little of the game play as possible. INV+ takes the opposite approach, trying to get as close to the game play of the arcade, sacrificing the look of the arcade where necessary. 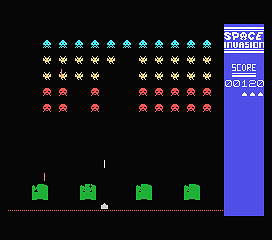 Developed by Bob DeCrescenzo (aka PacManPlus on the AtariAge.com forums) and published on cartridge in 2008, this homebrew conversion of the game features one or two players, stationary or moving shields, fast or slow enemy shots, visible or invisible invaders, straight or zig-zagging enemy shots, and the choice between 4 colors schemes. It is available for purchase through the AtariAge.com store, but the ROM is also available for download. Developed by Joe Hellesen (also responsible for the Atari 8-bit conversion of Pac-Man) in 1981. Far more faithful to the arcade than Atari's official conversion. 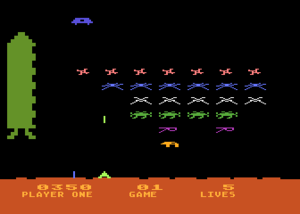 Roklan purchased the game from Joe and distributed it for the Atari computers as Deluxe Invaders. Note: In 2010, Krzysztof Dudek ported Apple Invaders, mentioned above, from the original Apple II program to the Atari 8-bit systems. 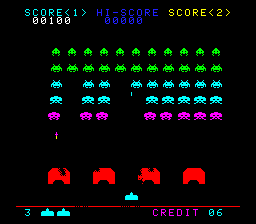 Developed by Bally, and originally intended to be titled Space Invaders. Since Bally Midway owned the US rights to the arcade game, they thought they had the rights to distribute the title on their home system as well. The name was probably changed due to the perceived threat of a lawsuit from Atari. Interestingly, Astro Battle is the name of the very Space Invaders like stage in the Bally Midway produced multi-stage vertical shooter Gorf. The Space Invaders Collection was developed by Eduardo Mello under his Opcode Games label and released in September 2003. 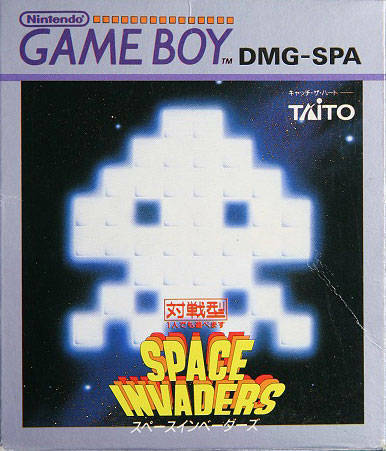 Contains pixel accurate conversions of both the original arcade game as well as Taito's Space Invaders Part 2 (also known as Space Invaders Deluxe). Before this, John Dondzila developed Space Invasion in 1998, which is also a very accurate conversion of both games, although it is not pixel accurate. 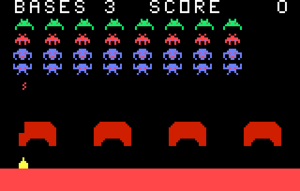 Avenger is the most accurate conversion of Space Invaders for the Commodore 64. Invaders 64 is another very close clone with small graphical changes. Released by Mattel in 1981 as Intellivision owners' answer to Space Invaders. Released by Magnavox in 1980 as Odyssey² owners' answer to Space Invaders. In 1996, John Dendzila published the first new game for the Vectrex since 1984. A tribute to Space Invaders, Vector Vaders attempted to capture the multi alien mayhem found in all conversions. However, limitations on how many images the vector system could draw caused a shimmering slowdown effect. Dendzila remade the game in a simpler, yet more playable fashion as Vector Vaders Remix, contained in his Vecmania compilation cart, which is the first 64K Vectrex cart. This page was last edited on 2 June 2010, at 21:51.